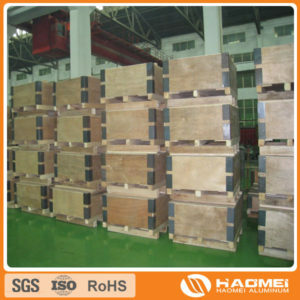 haomei Aluminum Industry in order to ensure that the aluminum sheet in the transport, storage, in order to allow customers to use a stable quality of aluminum sheet. After several years of repeated experiments, a clear standard of aluminum plate packaging has been worked out. 1. First of all, a dense waterproof film is used to wrap the aluminum sheet tightly and carefully sealed with adhesive tape to ensure that no part of the aluminum sheet is exposed to the possible damp air, and sufficient desiccant is placed inside the package. This is to ensure that the aluminum plate internal drying, not to allow aluminum plate to contact any liquid, prevent aluminum plate oxidation or corrosion. 2. Outside the waterproof membrane, wrap a layer of cowhide waterproof paper. This is mainly to ensure that the weak waterproof film will not be damaged, waterproof paper to a certain extent can also be isolated from external moisture, thick kraft paper can be a good insulation of the surface and internal environment temperature difference, to avoid the aluminum plate due to temperature differences too large water vapor condensation phenomenon, prevent aluminum plate oxidation. 3. Outside the kraft paper, the whole layer of corrugated paper will be covered to protect the edges and corners of the aluminum plate with special corrugated protection, and finally with metal wrapping belt will be aluminum plate and wooden saucer packed together. Strengthen several tons of aluminium sheet to prevent the aluminium sheet from falling and sliding during transportation, and avoid friction between aluminium sheet and aluminium sheet after fixing. After repeated tests, this packaging method can not only effectively prevent corrosion and oxidation of aluminum plate, but also protect aluminum plateduring long-distance transportation, aluminum plate will not be deformed and scratched because of transportation.